Along with my freelancer candidates, I've been hearing these phrases for decades. 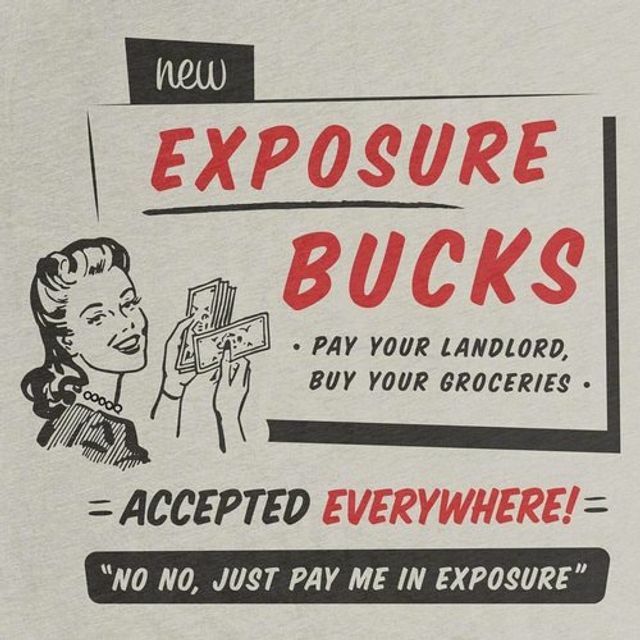 That's great and all, but you’ll notice when you buy something in real life there isn’t a payment option for ‘good exposure’. Creative seems to be one of the few industries where it’s deemed acceptable to negotiate down every time, or even have the gall to suggest people work for free. But why? Do you haggle with your electrician or plumber? Your lawyer? Dentist? Mechanic? Barista? Hell no! Then why is it acceptable for creative? It needs to stop. Today. Enough. If you’re delivering a skilled service, you charge for a skilled service. For some reason, there is this attitude out there in the workforce, at least here in NZ, where illustrators, animators, film/TV, musicians, seem to be a frequent target. But why? Is it a misunderstanding of the skill and process that goes into the finished creative? A lack of respect for the craft? Is it the subjectivity of the medium? A notion that because it looks like it might be a fun job, it shouldn’t be compensated to the same degree? A feeling that because work can be intermittent, people are happy to take what they can get? Remember - by accepting crummy pay, you lower the value of your work. By lowering the value of your work this does not make you competitive within your industry; it devalues your industry. But this is important - I’m not saying don’t do pro bono work. I’m not saying don’t do art just for the love. I’m not saying don’t take on a project or assignment because this one pays a little less. I will tell you that you need to make a conscious or strategic decision each time you make that commitment though. If you don’t know how or what you should be charging, talk to a professional who can advise you. How to cover your overheads. What’s fair for your level of skill and experience? Do you charge per project or hourly? What’s the market paying typically right now? How to weigh up those strategic decisions and get some advice. But its only an invite! I could do it, I just don’t have the time. It's just a cartoon and some writing, won’t take you long.